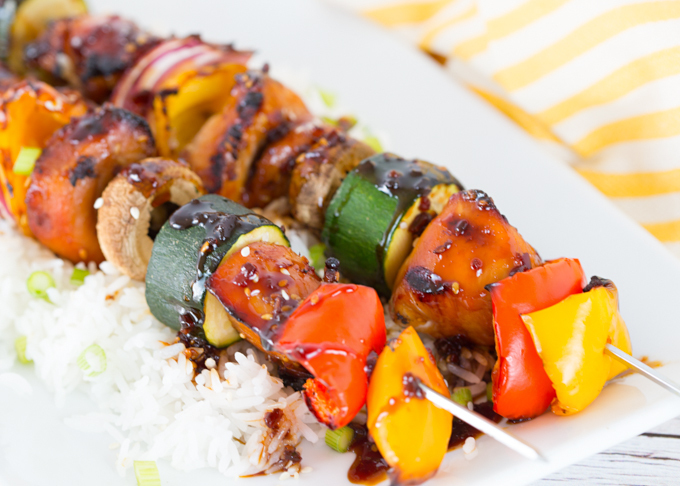 BBQ’d Teriyaki Chicken Kabobs are a must make this summer! 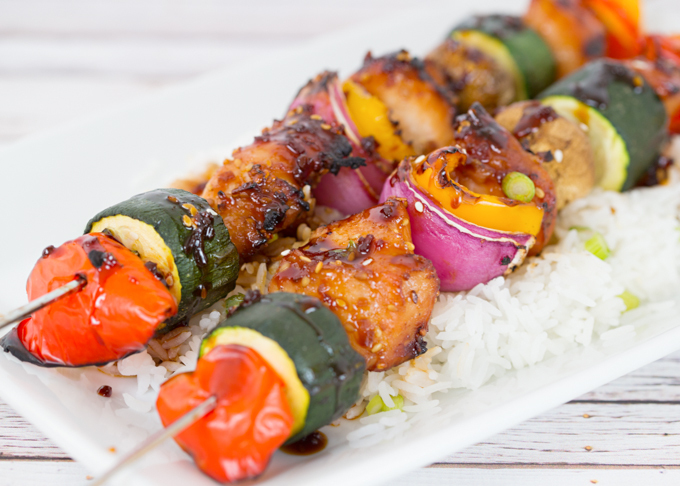 Tender marinated chicken grilled to perfection with fresh veggies, all topped with a glaze of teriyaki and served over a bed of steamed rice are the perfect summertime meal! Grab a cold beverage and dine outdoors for the perfect evening! 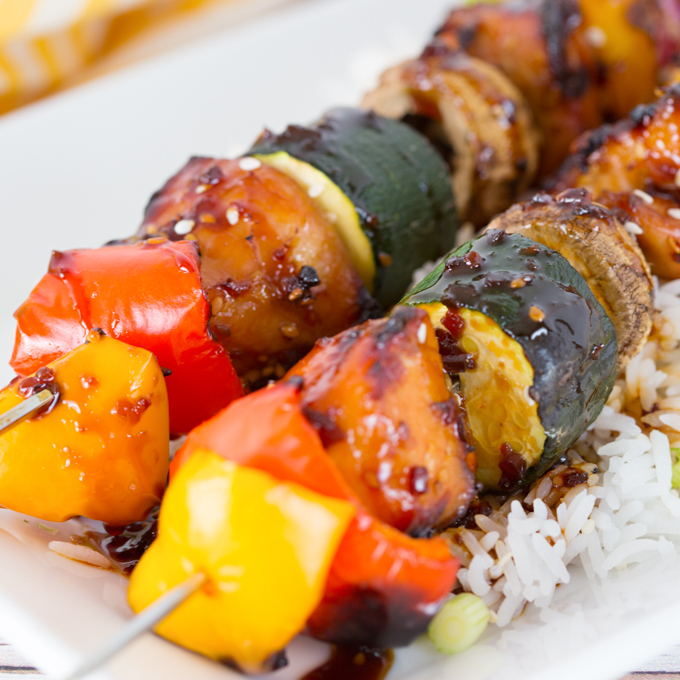 Teriyaki Chicken Kabobs are quick to BBQ and easy to prep. Begin by marinating cubed chicken, for at least an hour (or as long as overnight), slice up some fresh veggies, and skewer them up. Now just imagine these skewers BBQ’ing outdoors (oops, I didn’t get that picture, but you get the idea). 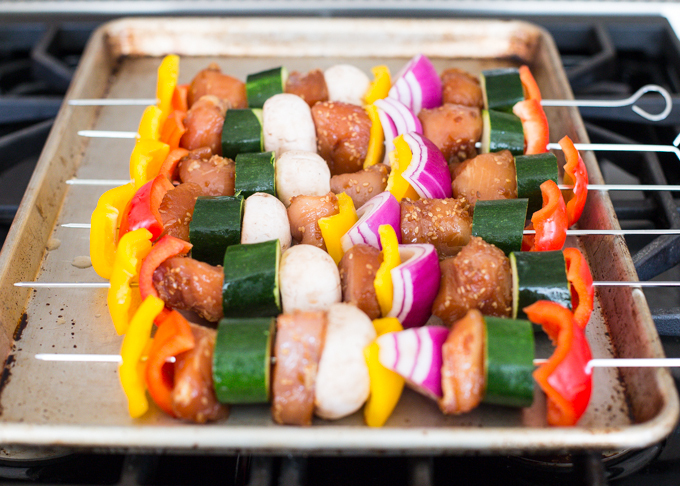 I used my metal skewers for these Teriyaki Chicken Kabobs as I find them a little sturdier than using wooden skewers, but either work, so feel free to use what you have. I topped my Teriyaki Chicken Skewers with a simple teriyaki glaze that I made by reducing down some teriyaki sauce until it slightly thickens. I used the same glaze that I used on my Sausage & Pineapple Kabobs. It’s simple and delicious! If you’re a big fan of grilling and dining outdoors, make sure and share this recipe! I’m excited to be participating at MEAL PLAN MONDAY! Make sure and check them out weekly for lots of delicious meal inspiration!! 1 cup Teriyaki marinade (for marinating chicken) I used Soy Vay. 2 Bell peppers (cut into large chunks) I used red and yellow. Place cubed chicken into a large zip lock baggie with 1 cup teriyaki sauce. Allow to marinate for at least one hour or as long as overnight. If you are using wooden skewers, make sure to soak them in cold water prior to skewering. This prevents them from burning on the grill. Skewer meat and veggies in any order you'd like. Serve over a bed of white rice and top with a drizzle of teriyaki glaze, and chopped green onion. Oh my goodness, I am drooling all over my keyboard! Seriously wishing this was on my radar for lunch. Delicious! The marinade on your kabobs looks fantastically sticky and sweet. This recipe is worth a try! These look awesome! Summer is here! Love the colors! So vibrant and flavorful!